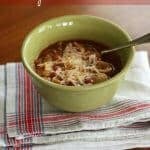 A twist on a traditional favorite, this Crockpot Lasagna Soup is SO easy to put together, tastes delicious and will quickly become a hit with your family! 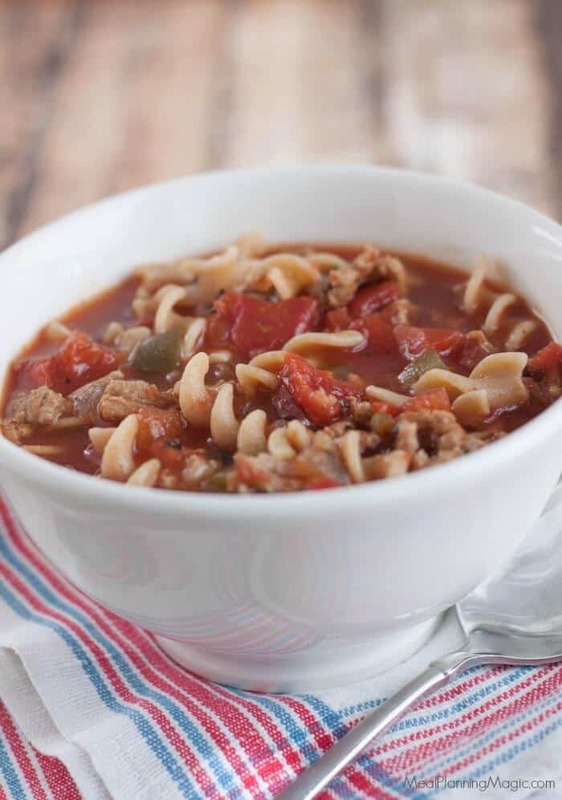 Click here to PIN this Crockpot Lasagna Soup recipe! This post originally appeared in 2015 but I’ve updated it with new photos. Everything else has stayed the same and it’s still one of our all-time favorite meals! I first tried Lasagna Soup several years ago after a friend told me that it was one of her family’s favorites. It was a stovetop version so when I found a slowcooker version online I was anxious to try it out. I love my slowcooker as it makes mealtime so much easier! 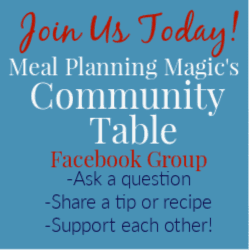 Inspired by a recipe from Family Fresh Meals that I pinned here, I’ve made several modifications since discovering it a year or so ago so thought I would share my version Crockpot Lasagna Soup with you all. One big change is that I make ours with Italian sausage. The spices and depth of flavor the sausage add so much flavor! I’ve also adjusted some of the other ingredients to help stretch the serving size a bit. Another change I made was to make the pasta separately. The original recipe called for you to cook it in the slowcooker the last 30 minutes before it’s done but what we found was that the pasta was unreliably cooked–sometimes it got overcooked, other times it was undercooked. Also, when there are leftovers, the pasta tends to get mushy so keeping it separate will still let you enjoy the flavors together with more reliable results. You’ll see that you can cook it on low or high, depending on how much time you have. I’ve done both and the results are just as delicious either way! This Crockpot Lasagna Soup is definitely a favorite and something I’ve made for company often–it’s that good! Next week I’ll be making it for a soup buffet our school is hosting for the teachers. Simple Slowcooker Ground Turkey, Barley and Vegetable is another big favorite that I like to make for others–it’s super easy too! 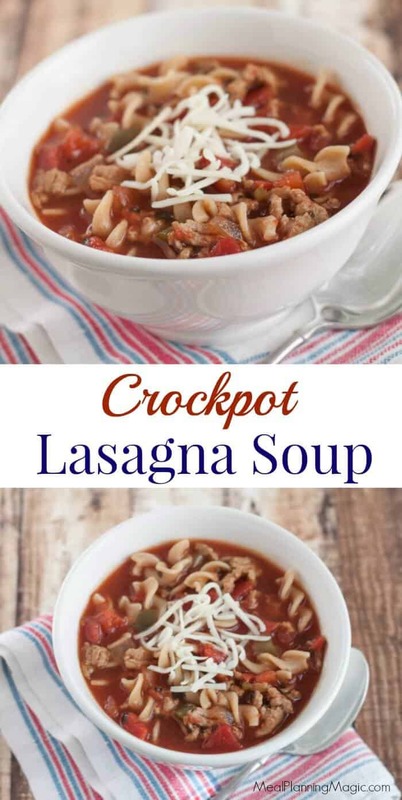 I hope you’ll give the Crockpot Lasagna Soup a try. I’d love to hear how you like it in the comments below. Enjoy! A delicious soup that tastes just like lasagna! So easy when it's made in the slowcooker too! 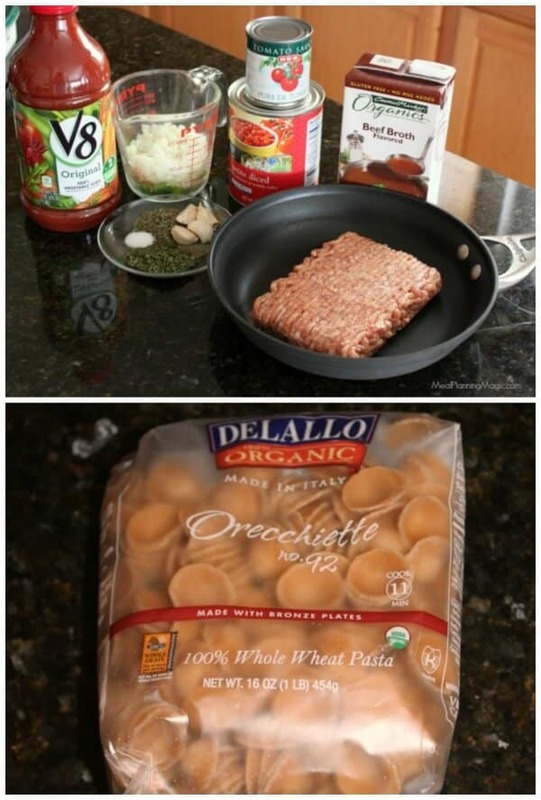 Pound bulk Italian beef sausage not the breakfast sausage! 2 cups uncooked shaped pasta of your choice shells, orecchiette, rotini, etc. In medium-large saute pan, brown Italian sausage until just cooked through. Drain off fat and set aside. In crockpot, combine diced tomatoes, tomato paste and V8 drink. Add onion and green bell pepper, garlic, parsley, basil, pepper and salt. Add sausage and stir all to combine well. About 30 minutes before it is done, cook pasta according to package directions. To serve, ladle about a cup and half of soup into a bowl. Top with a handful of cooked pasta (I usually just eyeball it). Top with mozzarella cheese. Enjoy! 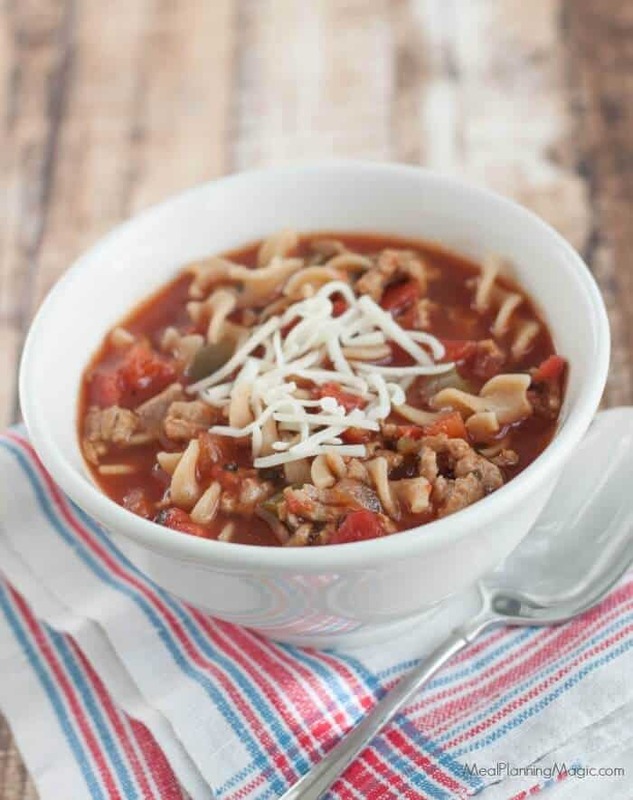 Just a few simple ingredients is all it takes for this Crockpot Lasagna Soup. 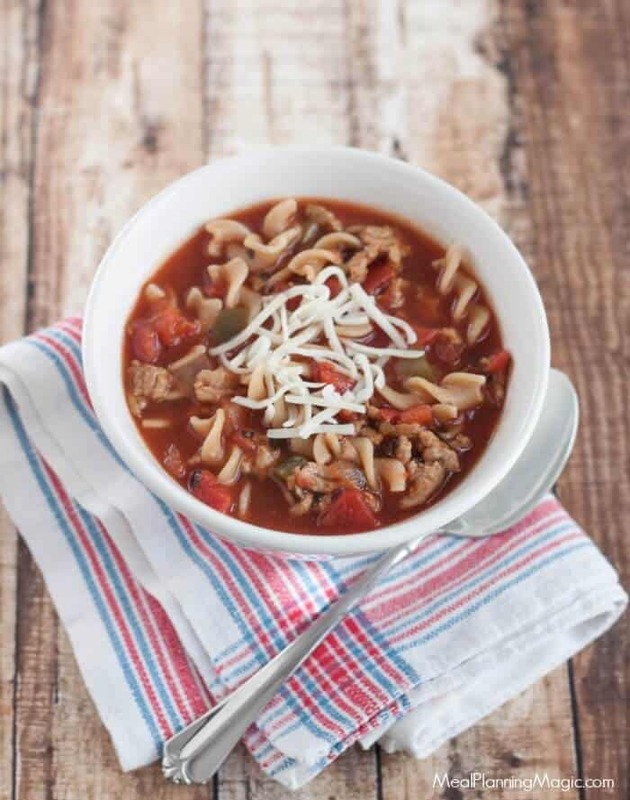 We like the whole wheat pasta and it tastes great in this soup!